See Bailly, likewise of Paris, time-honoured Historian of Astronomy Ancient and Modern. Poor Bailly, how thy serenely beautiful Philosophising, with its soft moonshiny clearness and thinness, ends in foul thick confusion — of Presidency, Mayorship, diplomatic Officiality, rabid Triviality, and the throat of everlasting Darkness! Far was it to descend from the heavenly Galaxy to the Drapeau Rouge: beside that fatal dung-heap, on that last hell-day, thou must ‘tremble,’ though only with cold, ‘de froid.’ Speculation is not practice: to be weak is not so miserable; but to be weaker than our task. Wo the day when they mounted thee, a peaceable pedestrian, on that wild Hippogriff of a Democracy; which, spurning the firm earth, nay lashing at the very stars, no yet known Astolpho could have ridden! On this date in 1793, French astronomer turned revolutionary Jean-Sylvain Bailly was guillotined during the Paris Terror. Bailly ditched a family trade in the arts — his father was a supervisor at the Louvre — and turned his gaze skyward. Bailly was not a great thinker or the discoverer of new concepts; no case can be made for placing his name beside those of Newton, Leibnitz, and Laplace. But he should not be denied a niche among the numerous competent and persevering work-a-day scientists who, perhaps, in the long run make possible the achievements of a few great men. His observations and reductions, his application of a mathematical discipline to the movements of the heavenly bodies, and his detailed publications had brought him, by 1766, considerable credit among fellow scientists. His “considerable credit” in the public sphere, enhanced by his widely-admired writing, set him up for election to the Estates-General in 1789. Indeed, Bailly was elected to head the body’s Third Estate. On June 20th of that pregnant year, days after the Estates-General had constituted itself a National Assembly with ambitions far outstripping the limited purpose of revenue collection the king intended them for, Louis XVI locked the delegates out of their meeting-room. Bailly, in consequence, would lead one of the pivotal actions of the embryonic French Revolution. “I do not need to tell you in what a grievous situation the Assembly finds itself,” he said to the assembly reconvened at a nearby tennis court. 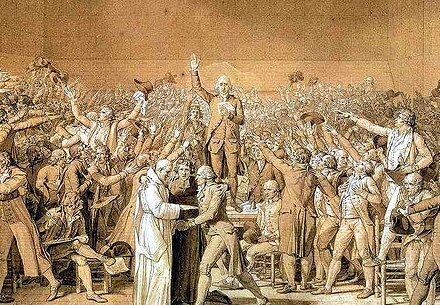 “I propose that we deliberate on what action to take under such tumultuous circumstances.” The result of that deliberation was the Tennis Court Oath. 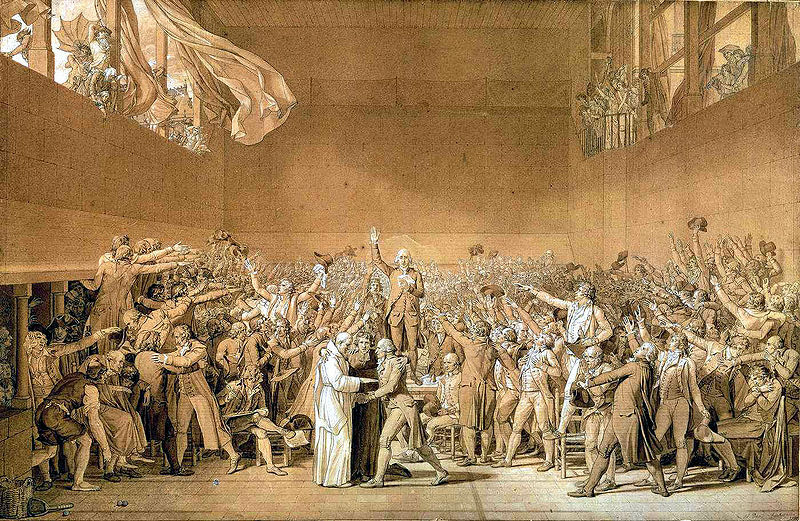 Detail view (click for the full image) of Jean-Sylvain Bailly administering the Tennis Court Oath, in Jacques-Louis David‘s sketch of the event. When the Paris provost — an archaic municipal office — was shot by the mob on Bastille Day, Bailly became the City of Light’s first mayor. But as with other principals of the Revolution’s earliest stirrings, like Bailly’s ally Lafayette, the man was left behind by the rapid progress of events. He’d been two years retired out of public service in Nantes when he was hailed before the Revolutionary Tribunal on the preposterous charge of having conspired in Louis XVI’s attempted flight and guillotined on that basis. 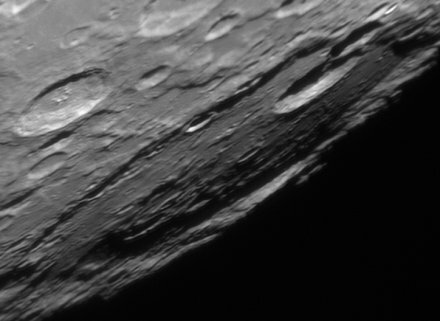 A lunar crater — the largest crater visible from earth — is appropriately named after this prolific observer of the heavens. * Edwin Burrows Smith, Transactions of the American Philosophical Society, New Series, Vol. 44, No. 4 (1954).